It’s time to tackle revising your NaNo novel (but these techniques work for any novel, really). For most of you, that means rewriting, not just editing. Typically, a writer gets a first draft on paper, then reads what she’s written and rewords some things, rewrites a few scenes, and possibly rearranges some of the action. How many of you rethink the main conflict or characterization, or the basic plot at this point? Probably not many. But those are most likely the places your story needs some adjustments. You just don’t know how to adjust it, unil you get to the end. As I said in my last post t, even if you don’t see anything wrong with your story, you can absolutely make it even better than it already is. The question you must ask yourself, Are you ready for a little work? Our Revising the NaNo Novel Workshop starts Jan 1, 2015. Click here to learn more! Do you want to work with what’s on the page right now, or do you want to make this story live up to its full potential, as you envisioned it before you even put the first word down? Only you can answer that question. But I promise, if you work through the steps with me, it will be a much better story. Let’s take a look at the elements of a story. This pyramid comes from Hal Croasmun. You see the base of the pyramid, the foundation the entire story relies upon, is the STORYLINE. The tippy top #6 WORD CHOICES is far from the key factor in the story. It’s what the reader sees, but if the lower levels are flawed, pretty words and just the right verb won’t do much to engage and entertain a reader. Rewriting—work on levels 1-5. Improving major and minor aspects of the first five levels. The wordsmithing of editing won’t fix a broken story. It’s like putting new curtains on a house whose roof is falling in. It’s also why when we get hooked into a really good story, we overlook less-than-stellar technical skills. This looks like a no-brainer. In fact, there is more to it than just identifying and fixing what doesn’t work or polishing your word choices. 1. Does your story fulfill your vision? When you sat down to plan or write this story, how did you imagine it would end up? Is it what you expected? Is more (great!) or less. If it doesn’t meet your expectations, dig to find out why. Did your hero turn out to be kind of weak? Did the main plot drag and fizzle in the middle? Did your other MC go off on a tangent? Did your story stay true to the genre? If you spot where the story has disappointed you, figure out how to correct it. If you’re not sure what’s wrong, have another person read it, and show them the pyramid. Which level isn’t working for you? Maybe everything works and you’re happy with the whole thing. A ground-up analysis can still make it even better. Your MC has a secret that creates complications. Now, what if you add in that her secret is connected with one of the other characters, further complicating the plot, characters and motivations? Better, right? Your MC’s father lost his family farm, that changed her life. She meets the hero while trying to find out who is behind it. Now, what if they are starting to fall for each other during the course of the investigation and it turns out it was HIS FATHER? You can go back and add another layer or twist even to a good story to make it great. Or a great story to make it incredible. It will mean some extra work to smooth in the new elements and properly set them up earlier in the book, but it’s worth it. To really improve your story, do a thorough rewrite first, then polish the finished product with editing/wordsmithing to eliminate mistakes. Most publishers focus on EDITING at level 6. A few dig to level 5, but you will almost never find an editor at a publisher who helps you correct or fine-tune issues at level 1-4. 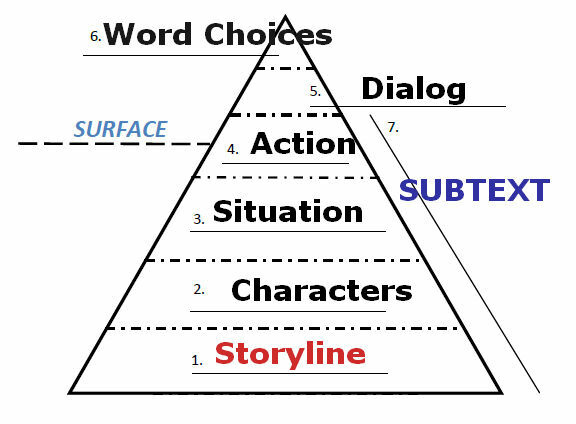 But these are the elements that really determine story quality and reader reaction. You will need to work on this yourself. (BTW, At Smooth Draft, we work at every single level. You will get notes, suggestions, comments on character, plot, theme, structure with a full content edit. We don’t rewrite it for you, but we point out how to improve the story at every level). Do you have beta readers? What level do they comment on? How low on the pyramid do they really look? Most beta readers, unless they are writers, won’t even think about how to fix a problem they see. Many won’t tell you when something doesn’t work, preferring to offer praise for the good stuff. But that doesn’t help you at all. In future posts I’ll discuss how to approach each level, spot the issues and think about solutions. You see #7 on the side? It covers levels 1-4. Subtext is the underlying situation, motivations and desires which the characters have that they don’t tell the others, or perhaps don’t even know themselves. It’s the truth under the façade. What are they hiding? What are they really after? Jane might want a job as an assistant to the warden of a prison. In reality, she’s there to find out how her brother, a guard, died. Subtext adds layers and knowledge gaps that keep readers reading…. what will she find out? will she be in danger? She really likes her new boss, but what if her new boss is part of a cover-up? It’s under the surface, and I’ll talk more about it later. Want more tips for editing and revising, and first crack at new worksheets? Sign up for the Smooth Draft Newsletter.